Mario & Wario is a puzzle game that utilized the SNES mouse. Nintendo had plans to release in North America, but for whatever reason it was a Japan only-game. It was slated for a Fall 1993 or 1994 release. Thanks to Skrybe for scanning the cereal box for me. 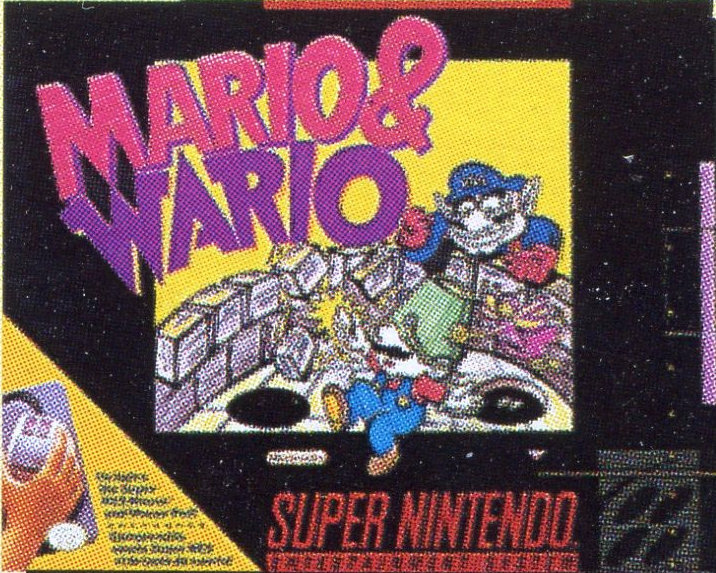 Mario & Wario was shown in the September 1993 issue of Nintendo Power in their preview section. The game is one of the few games that requires the SNES mouse accessory. The basic gameplay involves guiding Mario to a level exit (as Wario has put a bucket on his head) while Wanda the Fairy fills in blocks with her wand. I have no idea why this never got a release in North America, considering how high profile the Mario character is, and the fact that the game required no localization. Perhaps they felt they could not market another mouse based game. There is evidence that this game was close to being released. 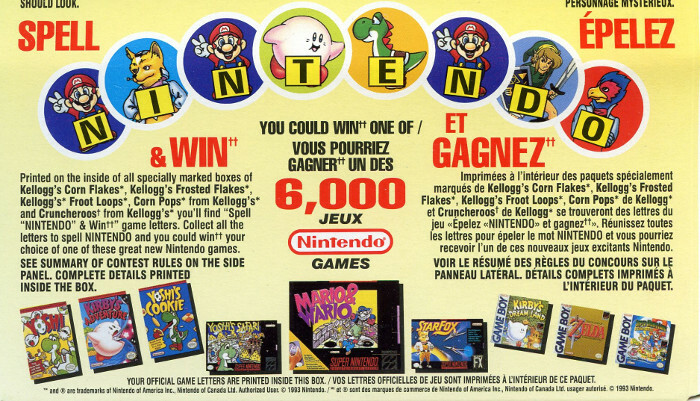 A contest on boxes of Kellogg's cereals in Canada shows the box art for Mario & Wario. Unfortunately, the colours are pretty washed out. Note that the box art for Yoshi's Safari is also different from the final version. Man, I miss Cruncharoos cereal. Contest display on the back of the box. High resolution scan of the Mario & Wario mockup. If you look at the contest entry form, it seems that an exact release date for the game was not set. There is an asterix that says "Available in 1994". The official rules also indicate that it unlikely anyone would have been able to redeem these prizes (1 in 950 assuming you collect all 14 letters). By the contest closing date of November 30, 1994, most of these games would have been pretty old hat. Ah, fine print. 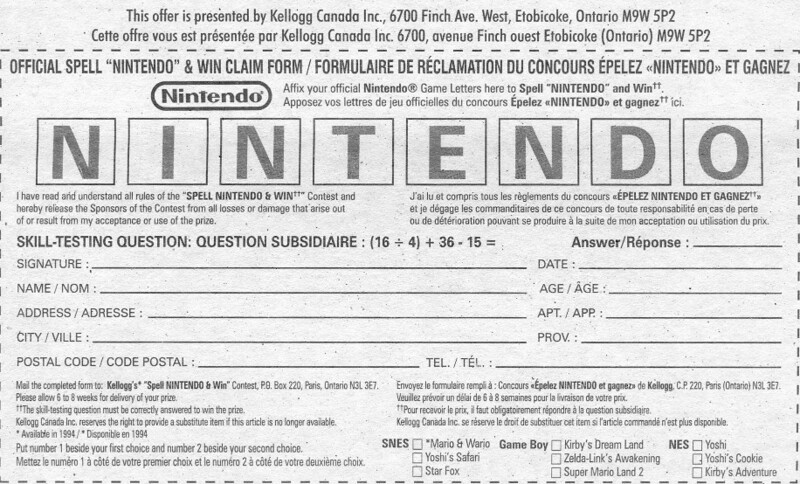 I'm sure that just printing the contest on the box sold a lot of cereal. The contest form. Note that Mario & Wario doesn't have an exact release date. 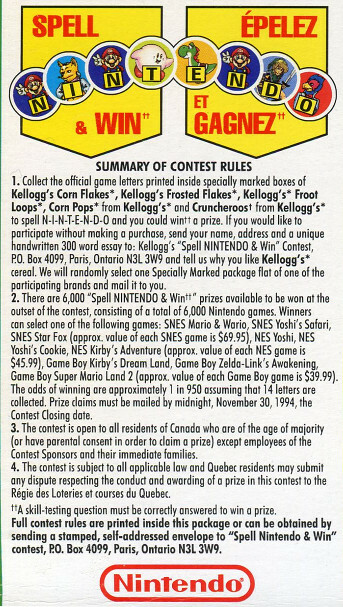 The contest rules indicate it would be very difficult to win any prize.